We were so fortunate to have Vaughn Barry as our wedding photographer. Not only did he capture beautiful moments at both our engagement shoot and our wedding, but he is so wonderful to be around. From the very start Vaughn made us feel so comfortable and always made us feel like such a priority. He always worked with us to make sure our photography was what we wanted – and he always exceeded our expectations on that. Not only is he so easy and fun to be around, he is also incredibly professional. Our photos were presented to us using a beautiful online platform that made it so easy to share with friends and family and pick and choose the ones we loved to have printed. Our family and friends have raved about how awesome he was and how stunning the photos are. He is beyond fantastic and we highly recommend him to any couples looking to capture their special day. When I was searching for a wedding photographer, I looked at a bunch. Coming from a photographer family, not only did I want pictures that I loved the look of, but I also wanted pictures that were technically correct. Vaughn’s work blew me away and I knew I had found my photographer. Not only is his work amazing, but he’s also a TON of fun and such a breeze to work with. My husband doesn’t love being in front of the camera, and Vaughn had him laughing and relaxing easily! And not only that, but he was able to make even our posed shots look natural and candid – and that’s talent! On the day of our wedding, my photos were the one thing I didn’t have to worry about. Vaughn was organized and knew exactly what shots he wanted to get – but then he was also able to go with the flow and get the shots that just presented themselves. I’m in love with every photo I’ve seen and the one photo I was really hoping for (the first time my husband saw me – walking down the aisle) was better than I could’ve ever imagined. There is so much to keep track of on your big day, give yourself one thing you won’t have to worry about – book Vaughn as your photographer! I first found Vaughn Barry on Pinterest. I liked his work and found more on Instagram. When it came time to plan our wedding, I was so excited that he was willing to go to Punta Cana from Canada for our wedding. It was so far to travel and all for a very reasonable price! We got to chat ahead of time to get to know each other. He is so easy to work with and made the entire process easy and stress-free. Last night I got my photos back from Vaughn nd cried tears of joy. His work is amazing! I am beyond happy that we chose him as our photographer. Everyone at my wedding commented on how professional he was. He was able to capture the best moments without being intrusive. He made real connections with our guests and made the entire process fun. In addition to the classic shots, he was creative and able to provide us works of art that we will cherish forever. I love how he had vision and was able to communicate with us. The quality of pictures from the wedding and the ceremony were amazing. We also did a trash the dress session in addition to our wedding photos and it was a blast. Vaughn was in the water doing whatever it takes to make magical photos. If you are planning a destination wedding – please make sure you budget him in for your photography. You will not be disappointed!!! – Katie + Tom | Hard Rock Punta Cana, Dominican Republic. Peek behind the scenes at their trash the dress session. We met with Vaughn for coffee after seeing his online portfolio and between the two of us, we knew we had to book him. Aside from his obvious photographic genius, Vaughn’s sense of humour and laid back demeanour made the entire process of our engagement and wedding day shoots 100% enjoyable. What impressed us the most was how he took the time to not only get a feel for what we were looking for in terms of our photos, but to genuinely get to know us as people, not just clients. By the end of it all, Vaughn was like family. Our wedding party loved working with him and our friends and family haven’t stopped raving about our photos which took our breath away. We can’t imagine having anyone else mingle with our people and capture all the love our day was filled with. We just returned from our destination wedding in Punta Cana, Dominican Republic. Vaughn is the destination wedding expert. Not only did his photos turn out amazing, he helped me with so many questions I had about destination weddings in general. He really takes pride in what he does, and cares about his couples. By the end of the day, you feel like you’ve been hanging out with an old friend the whole time. I cannot say enough good things about working with Vaughn. Photography was one of the most important things on our list, and Vaughn far exceeded our expectations. Thank you Vaughn! Josh and I did quite a bit of research for wedding photographers. We chose Vaughn. We checked his website, read reviews, and most importantly, viewed galleries of his images on his website, blog and Instagram. We were stunned by the excellence of his work! Vaughn was very clearly the choice for us. In addition to galleries, Vaughn has many helpful posts about getting ready for your photo shoots and what to expect during your photo shoots. We contacted him, and he quickly responded. We arranged for a video chat, and we instantly loved his personality and his professionalism. Vaughn took our engagement photos and our wedding day photos. Comparing them to the galleries of other engagements and weddings we saw online: ZERO disappointment! We find ourselves grinning ear to ear as we (obsessively) look through our photos. There are so many incredible and special moments that he was able to capture, and they appear so perfectly natural, while also perfectly stunning. So many people have commented that our wedding photos are the most beautiful photos they have seen. We appreciate that people may feel inclined to simply tell us what we want to hear. But the defining moment was when we were with a group of friends in the week after the wedding, and between themselves, I overheard them saying that they wished they had an event to book right now, so that they could have Vaughn take the photos. He was impressively funny, easy going, and downright good at his job. He connected with EVERYONE! Vaughn went above and beyond for the perfect photo shoots. He has a great sense of humour, he made us feel like we were models, while providing the slightest direction when it was needed, to get the perfect photos. Vaughn spent time in advance of our photo shoots roaming the grounds to get the perfect locations, the perfect angles and the perfect light. He even knew what time of day for different locations would work best. On our wedding day he also brought another photographer, Sam. She was also very incredible and she and Vaughn worked so well together. We initially met Vaughn as he was the wedding photographer for my best friend’s wedding. He’s one of those people you meet for the first time but feel you’ve known your entire life. Vaughn has a great personality; very cool easy-going kind of guy while maintaining a high level of professionalism. He’s scheduled, disciplined, punctual, and ensures the entire wedding day remains on track. After observing all these incredible traits, choosing Vaughn to be our wedding photographer was an easy decision. Vaughn is flexible when scheduling times to meet, replies quickly to emails, and is well versed in the realm of technology! We planned our entire wedding photo itinerary over video conference and had multiple touch bases leading up to the big day to accommodate any changes. Our minds were always at ease knowing we could get a hold of Vaughn with a phone call, text, or few mouse clicks. Vaughn is a truly gifted photographer with the unique ability to capture moments a couple can treasure for a lifetime. A quick review of his portfolio and it’s undeniably evident that he is a master in the photography world; his work is phenomenal. Vaughn, we can’t thank you enough for all your hard work and dedication as our wedding photographer. We’ve looked through our wedding photos with friends & family on numerous occasions and it still feels like we’re seeing them for the very first time. Thank you! Vaughn is the best – he helped me stay calm and made our day run so smoothly. He is a destination wedding expert and is so much more than just a photographer. He really was the best decision we made during our wedding planning process. There are literally no words to describe Vaughn Barry! After the first 5 minutes of meeting him we knew he was a perfect fit for us, besides the fact that his portfolio is exquisite. His professionalism is unlike any other!! Starting with our engagement shoot, he definitely warmed us up quick and within minutes we both felt comfortable in front of the camera. We had such a blast, laughing and joking, and laughing some more, and our happiness shined through in every picture! I didn’t think his skills could get any better after seeing his magic on our engagement shoot – but Vaughn never ceases to amaze us! On our wedding day, Vaughn managed to make every single person in the wedding party comfortable, and again had everyone in stitches! At one point we thought he was going to stay all night with us he was having so much fun!! His skills are second to none, and you have so much fun hanging around him all your nerves tend to escape you! If you want someone who is incredibly personable, down to earth, easy to work with, produces breathtaking pictures and ALWAYS goes the extra mile to ensure a quality picture, then Vaughn is your man! We were absolutely honored to have him play such a large role in our wedding and I can’t picture our day without him now!! He has become our lifelong photographer!! We cannot recommend him enough!! Pictures have always been super important to me, so I knew long before we got engaged that our photographer would be the most important choice we would make once the time came to plan a wedding. When I came across Vaughn’s website, it was immediately apparent that he was the guy to capture our wedding. When we met him the following week, it only cemented my first instinct about hiring him. His personality, like his photos, is impossible not to like. I have now had three experiences with him – our engagement session, my bachelorette, and our wedding. All three times he made everyone involved feel comfortable and at ease, he had great ideas and accepted ours as well, and all three times we had beautiful photos delivered to us in a very short amount of time. We have received numerous compliments about all of his photos we’ve shared, and I can’t stop looking at them myself. He is also up for literally anything (we dragged him through 5 feet of snow) – and super good at keeping a straight face when he is in on a joke being played on the subject of the photo. Needless to say, the next time we need a photographer, he will be the first guy we call. He seems like he’s part of the family now anyways. Choosing a photographer was the most important detail for me for our wedding. From the second we met Vaughn we knew he would be perfect for capturing our wedding day! His profile online shows what amazing talent he has for photography and after meeting with him we could see how passionate he was about it as well. He collaborated with an amazing team of vendors to create a beautiful engagement shoot that we could never have dreamed of. Right away he put both of us at ease during our shoot, making us laugh and capturing those moments. Thank you Vaughn! It truly was a pleasure having you! A year and a half ago right when we had gotten engaged, I remember Vaughn was the very first photographer recommended to us from a previous client of his who could not say enough about him and after looking at his work we knew exactly why- his work speaks for itself! After a few initial emails and a meeting over coffee it was the perfect fit and we were so excited to have Vaughn be such an important part of our big day! During our engagement session we got to know Vaughn a bit better, and any “nerves” we had went away instantly. It truly was just like hanging out with an old friend, except you get stunning photos to go with it! Vaughn didn’t even question it when we asked to include our pet pig, Archie, in the photos haha! The entire year leading up to the wedding day Vaughn was always just a short email or phone call away and was always very quick to answer any questions we had, even the silly ones! He was such a helpful role in helping us plan out the entire timeline of the day! Come wedding day, we couldn’t have asked for more from Vaughn. He was so on top of everything, organized, kept everything moving without letting us know or worry if we were behind schedule or not and was just a blast to spend the day with! We had (literal) hurricane like winds and rain on our day and Vaughn kept us worry free, laughing and smiling the whole way through! We never once worried that due to the weather we wouldn’t get “certain shots”. In fact, despite the insane weather Vaughn kept us venturing and adventuring through it all day, worry free, which ended up resulting in some of the best memories and stories- and I’m sure photographs too! Having a groom who is not very comfortable being the center of attention or being on camera, Vaughn made him feel very relaxed. Not only that, but in such a short amount of time Vaughn truly goes out of his way to get to genuinely get know you as people and not just clients. He was able to maintain a high level of professionalism with his work while at the same time letting his true personality and creativity shine through, which makes him very easy to work with and makes for a truly fun experience – exactly what you’d hope for on your wedding day. From start to finish he made sure that everything was on time and going as planned which allowed us to enjoy all the little aspects of our big day without all the stress of time management. Not to mention our family and friends loved him and could not stop raving about how awesome he was to spend the day with. Hiring Vaughn was one of, if not the best decision we made when planning our wedding and we would highly recommend having him as arguably the most important addition to your team for your special day! We couldn’t imagine having absolutely anyone else to hangout with and capture our best day ever. If only we could get married again, simply to have Vaughn take more stunning photos for us!!! Guess we’ll have to come up with another excuse :) We are so grateful and excited to be able to reflect on Vaughn’s talent for the rest of our lives! There are seriously no words to describe how amazing Vaughn Barry’s photography is and I would strongly recommend him to anyone. Choosing a wedding photographer was such a huge/scary thing for us because having great photos was such an important part of our wedding must-haves list. We are so unbelievably grateful that we met Vaughn. I met with him without my fiancé because he was the first meeting and I figured I was the picky one and I could weed out photographers before we had to have a final meeting to discuss details. Within minutes of talking to Vaughn I knew we had to choose him on the spot. He is professional, comforting, enthusiastic, so fun to be around and not only does he know so much about photography but he is also so helpful with everything else; timelines, order of events, etc. We met with him for our engagement shoot, a good test for wedding photos and we were BLOWN away. It was such a fun and easy day and he was so patient with us having never done a photo-shoot before and both not knowing what the heck to do and was so accommodating of our dogs being in the shoot. We got the photos back SO fast and had so many compliments on them from family and friends. We loved all of them. Completely took any inkling of stress we had left in us for wedding day pictures, we had ZERO doubts in him. His pictures honestly speak for themselves, he seriously captured our entire magical day perfectly. Every feeling, every moment… EVERYTHING! We wanted to feel comfortable in front of the camera, not have anything that looked too forced, and he did this spot on. He made us all laugh, joked around with us all day, got along with everyone, made everyone feel comfortable and ultimately was just fun to be around on such a special day. He seriously goes the extra mile, getting into whatever awkward position he has to just to get the perfect shot haha. Our wedding was less than two weeks ago and we already have the photos!! We have had so many compliments on them already and I am just blown away once again. I feel like you always accept that you will like a lot of wedding photos and love a handful of them that you want to blow up, but I honestly cannot choose my favourite, I LOVE them all. Best. Photographer. Ever! BOOK HIM RIGHT NOW! If we could give Vaughn ten stars we would. We got married in August at Blue Mountain, and Vaughn did our wedding and engagement photos. Next to getting married Kaitlyn and I both agreed that Vaughn was the best decision we made for that day. Personally: Vaughn brings professionalism and is able to bring just the right amount of life to the party that a photographer should bring. He is funny, engaging and keeps people having fun while also taking his role seriously. Photos: Every photo took our breath away. All our friends and family say that these were some of the most unbelievable engagement and wedding photos we’d ever seen. Soon after the wedding passed, our venue reached out to us and asked if they could use some of our photos for their wedding catalog. Professionally: Showed up on time and prepared. We were able to maximize the time we had because of Vaughn’s experience. Vaughn returned over 600! wedding pictures uploaded and edited before we even got back from our honeymoon only 7 days later. Vaughn is worth every penny and we will be keeping his number for maybe an anniversary shoot someday! Hiring Vaughn was the best decision we made in our wedding planning process. He is genuine, talented, and takes his job seriously. He set up classic group shots, artistic pictures, and candids expertly and with friendly direction. My husband and I are a bit shy but felt so comfortable in front of his lens. He is also great with kids and directed the five years old flower girl and ring bearer with ease. He seems to truly enjoy his job and was energetic the whole day and his happy disposition never wavered. Hire Vaughn without a doubt in your mind. An investment in his talent will give you priceless pictures and memories. Looking at his pictures evokes all the emotions I felt on my wedding day. He seemed to have an intuitive knowledge of moments to capture and seemed to be in a million places at once. Highly recommended!!! Vaughn is a magician! He was so amazing and professional during the entire process. Both our engagement and wedding photos were incredible. He and his staff truly captured who we are. Vaughn goes above and beyond for the perfect shot, standing in prickly trees or laying in snow banks… he gets it done! His sense of humor matched perfectly with ours, making the whole day so easy and light-hearted. I guarantee you… Vaughn is your guy!! Vaughn was so lovely to work with. He made us feel instantly at ease, and gave us memories to last a lifetime. Photos were at the top of the list of importance for our big day, and not only did he knock it out of the park, he also got our wedding photos to us within two weeks! It was unheard of to have our pictures so quickly. We have already had friends who were in the wedding approach him about doing theirs, as he was so wonderful to work with. We would recommend him without question. Vaughn blew me away. My biggest piece of advice is to just trust this man wholeheartedly – he had us shuffling up a brambly hill at one point and we thought “well this is going to look awful” – well we were wrong (see photo above). The other cool thing about Vaughn is that he is artistic and has stunning vision, but he’s also kind of a bro. He loves hockey and appreciates Adam Sandler movie references and fist pumps when he gets a really good shot, but then he produces these whimsical photos that look like something out of a high fashion magazine. To have such beautiful photos come out of an experience that was so chill and easy was mind-blowing to me – I thought we were just going for a walk and having a good time, then the end product is this insanely beautiful piece of art. This man is incredible. Invest in your photography, stop looking elsewhere, book him now. 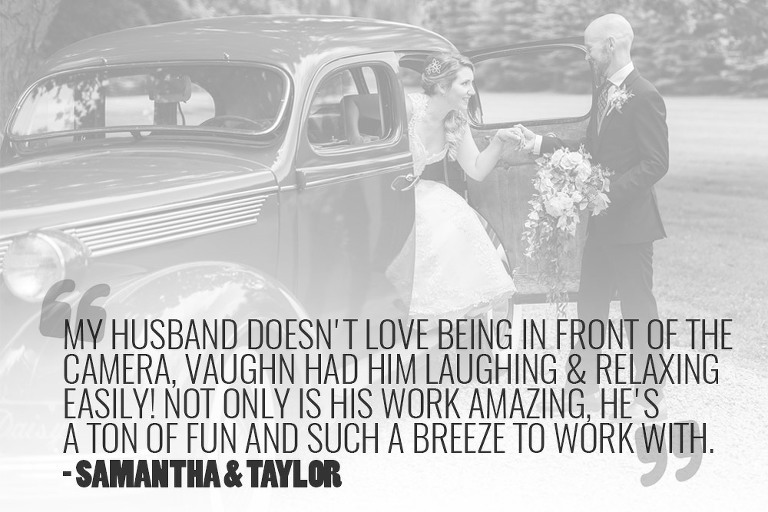 We were referred to Vaughn from a previous client of his after their wedding and are so glad we ran with it! We hadn’t ever had a professional shoot done before and we definitely wouldn’t have considered ourselves to be photogenic but Vaughn had a way of bringing out our best. He made us feel so comfortable while being so personable! Vaughn’s response time throughout the planning phase was impeccable, his experience in the industry was so comforting and he went with the flow when we sprung many small details on him throughout the day that we wanted captured. Our minds were at ease knowing he was just an email or text away, not to mention we received our photos back in record timing after the wedding! We look forward to being able to reflect on his work for the rest of our lives. Vaughn has been an absolutely amazing support for us since we had the good fortune to meet him over Skype just over a year ago. He took the time to get to know us individually and as a couple, and was able to recommend beautiful locations for a fun and relaxed winter engagement photo session in the Muskoka area. When we arrived up North for our engagement session to meet Vaughn in person, he had already purchased our park pass, scouted the location, and was ready to put us at ease for our first photoshoot. We truly appreciated Vaughn’s amicable and light-hearted style, which (combined with his patient attitude) made it easy for us to learn from Vaughn the basics of posing as a couple – a huge help then and on the wedding day! We left that day knowing that we were in excellent and professional hands. Once again, Vaughn delighted us by diligently posting our engagement photos at seemingly superhuman speed on his easy-to-share online platform. We were quick to relish in the excitement that he had beautifully captured of our day in the snow. Over the course of the six months after our engagement shoot, Vaughn was a consistent source of calm and expertise, particularly as we planned the flow of our wedding day with multiple vendors, in a remote location. 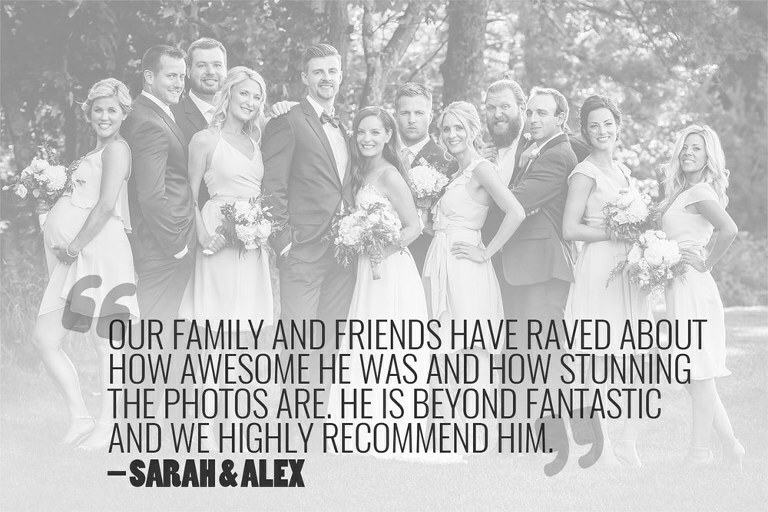 We were very grateful when he took the time to review our multi-page wedding itinerary and offer useful advice that allowed everyone to relax and enjoy the day. On our wedding day, Vaughn unsurprisingly bonded with our families and wedding party, and worked in perfect collaboration with our vendors and wedding coordinator. Throughout the day, he was truly a guiding force for us, as we navigated between all our events. We are particularly grateful for his flexibility, humour, and reassuring demeanour. As with our experience last winter, we were absolutely thrilled when, in record time, Vaughn sent us the link to our full wedding album within his online platform. Meghan admits that while honeymooning, her attention was drawn from the Hawaii oceanfront to those photos, and it was hard for her to pull herself away from scrolling through the photos to enjoy the sun and sea. We have been absolutely blown away by Vaughn’s artistry and his ability to capture all the love we experienced for one another and with our families on our wedding day. This love is visible in every frame. We are so grateful for all of his hard work and would highly recommend his services to anyone looking for a professional, friendly, and easy-to-work with vendor who seemed to surprise us by going the extra mile at every opportunity that he could. – Meghan + Justin | Arowhon Pines Resort, Algonquin Park. Peek behind the scenes at their wedding. My wife, Emily, and I hired Vaughn for our October 2017 wedding at Belcroft Estates in Innisfil, Ontario. We met with him nearly a year in advance and within five minutes we could tell that he was the right choice for us. Vaughn is genuinely kind with an easy-going personality and a great sense of humour. Beyond that, he is truly passionate about photography. Of the countless decisions we made throughout the wedding planning process, we can easily say that hiring Vaughn was the best. We honestly could not have been happier shooting with Vaughn on our special day and our final photos turned out absolutely stunning. – Emily + Scott | Belcroft Estates. Peek behind the scenes at their wedding. Vaughn was incredible from start to finish. It was one of the coldest days on record for Ontario, and yet there he was: lying in the snow, climbing into drifts, and sliding on the ice just to get the perfect shot. The photos he took tell the story of our incredible day and thanks to him we now have it frozen in time… so to speak! Despite a difficult room lighting wise, we are incredibly pleased with how creative he was to make sure that wasn’t an issue and our photos look fantastic. We could not be happier with how the day went and would recommend Vaughn to any couple planning their wedding! When writing a review about Vaughn I honestly don’t know where to start. I think it’s best to begin with one word: WOW! Vaughn was more than I could have ever hoped for, in every way. My husband has never been good with photos, and was more nervous about that part of the wedding than anything else. When we had our consultation, I knew immediately that Vaughn was perfect for us. During our engagement session we both had so much fun! And not to mention the photos were fabulous. Leading up to the wedding day, Vaughn promptly answered every email, every stupid question, and was so incredibly helpful when it came to helping me plan the day. The wedding day itself was even better. I am certain that nearly every guest at my wedding complimented his professionalism, how genuine, and all around awesome as a person and photographer he was. He was never in the way, but didn’t miss a shot. We had all the photos back a week later, and they were absolutely spectacular. I honestly can not recommend Vaughn enough. Vaughn was literally the perfect photographer, I couldn’t be happier with everything. You will not be disappointed if you choose him for your special day. Vaughn was professional, organized and easy going from the first phone call we had with him. Vaughn’s talent, humor and genuineness made the awkwardness of having tons of photos taken super easy. There is nothing about our experience or working with Vaughn that we would change. When we got back our photos we were blown away! Vaughn did an amazing job catching all of our wonderful memories from our wedding day and we could not be more grateful! We would highly recommend Vaughn as he was professional and kept us on time all day. He was also a ton of fun! Well worth the money! He even sent us 9 photos the next day for us to look through which was a ton of fun for us on our way to our honeymoon! We spent an hour or so with Vaughn and what I appreciated about him the most was his artistic mind set, he’s not afraid to get dirty on the ground or climb on things to achieve his visions or perspective, equipment is one thing but to make it work for what’s behind an artists eye is talent! A perfect combination. He was accommodating and open to suggestions with a calm demeanour and a humourous personality, loaded with ideas and vision of the medium he’s working in, very professional. The proof is in the product. Thank you. Vaughn is amazing! He did a wedding for a friend of ours, and after only seeing just a few shots we new he was the one for us as well. From the very first meeting, he came with so many good ideas. He had no issue having to drive out to the middle of nowhere to our wedding to capture our special day! He is super friendly and quickly becomes part of the family! I would recommend him in a second to anyone. Doesn’t matter what theme of wedding you’re doing he’s got it all! We are over the moon happy with all of our captures and can’t wait to enjoy looking back on our day for years to come!!!! I discovered Vaughn when a friend of mine got married, I loved his photos and made the decision that Vaughn was shooting mine. Best decision ever. Vaughn was easy to talk to, so helpful, offering suggestions for keeping warm, so friendly, and professional. Our photos are breath taking. We are eternally grateful for the time he spent with us, and the beautiful memories we have from our very special day. Worth every penny. It was no question that photos were going to be one of the most important pieces of our wedding; so finding the perfect photographer took us awhile. However after our long search we had no doubt we found the perfect one after speaking with Vaughn. His knowledge, and expertise was extremely evident not just through his photos but also talking to him. He is very experienced in destination weddings and helped us not just with photos but planning advice, and reassuring us he would take care of everything 🙂 which he did! His professionalism, and creativity shined through. The artistic approach and personal touches to his photos make them unique keepsakes to cherish forever, as he customizes to each couples personality. The photos were everything we imagined and more. Everyone we have talked to has said they are the most gorgeous wedding photos they have ever seen. Vaughn has passion, patience and creativity, all of which we think are amazing qualities to have in a photographer. We could not be more happy with our decision and highly, highly recommend him for future couples! We would 100% recommend Vaughn Barry to anyone getting married and looking for a photographer. Vaughn was very professional, fun to spend the day with, on time and on the ball with everything. Every picture he took was beyond amazing! He is now our lifelong photographer!! Vaughn is an amazing photographer!! His assistant is also amazing! He is super easy to work with and makes you feel very comfortable. Our wedding photos are beyond our expectations! We love them :) Book him you will not be disappointed!! Working with Vaughn was so fun and easy. Once we met him and had such a blast at our engagement session we couldn’t wait to have him capture our wedding. And he definitely didn’t disappoint on our big day. He is such a down to earth guy and knows how to break the ice and make you feel comfortable. Thank you so much Vaughn for our beautiful photos. You really outdid yourself! Vaughn was the wedding photographer for our destination wedding this May. I found Vaughn by doing a google search of destination wedding photographers and he was also referred to me from my travel agent. From the moment we booked with Vaughn I could tell that we were in good hands. When we talked (about a year before the wedding) I was impressed with how knowledgeable he was regarding the do’s and don’ts of resort weddings. He was able to give me some excellent tips for planning and made me fall in love with the idea of the first look. When we met at the resort he was so down to earth and easy to talk to. On our wedding day he made everyone feel so comfortable and he was able to keep us all laughing the entire day (even after a torrential rainstorm started during the ceremony). Vaughn was very accommodating, he even braved a grumpy bunch of hungover partiers a few days later to get me the group shot I missed out on because of the rain. We have only seen a few (amazing) teaser photos but from those I can tell that I am going to absolutely love our wedding photos. Thank you, Vaughn for capturing our wedding day and for sticking it out during the rainstorm. We couldn’t have asked for a better photographer! I can’t say enough good things about Vaughn and his work. As soon as we met with him we knew he would be the right person to work with. We did our engagement shoot with him and were blown away at the pictures we received. I thought it couldn’t get better – and then we received our wedding photos! I love every single shot we have! Vaughn has such a talent for what he does – he is a definite must for your big day! I couldn’t recommend him enough! What can I say about Vaughn, well he is extremely creative, energetic, educated, precise, friendly and out going that is only to name a few. Shooting with Vaughn was not trivial as he made it extremely easy and the best part he explained each shot as he was taking it so we understood what he was trying to capture this enhancing each shot as we moved along. My wife and I both felt comfortable with him, Vaughn effortlessly made the environment calm and creative as if you were just hanging with a bunch of friends taking photos. If you are looking for brilliant photos that captivate your moment then Vaughn is your guy, I would not hesitate recommending him. Not only did we have great success with a great photographer but added a great friend to our mix. His personality is like no other, his talent is endless and you will not be disappointed. Feel free to contact me for more information, a look into our photos or any questions you may have about Vaughn I am more then willing to offer any information about him. I had Vaughn secretly photograph my engagement and I have to say Vaughn was outstanding. It was very easy to set up organize with Vaughn, we met up and he walked through everything with me, locations times and the best place for photos. He was incredibly personable, down to earth and easy to work with. When it came time to take the photos, my fiancé had no idea he was there and he did amazing work taking great photos to capture the moment, which scored me huge points. Afterwards we walked around to different spots and took some great photographs to capture the moment. Shortly after Vaughn sent over a couple photos to send out for the announcement. We couldn’t be happier for all he did and how easy he was to talk to and work with. Thanks for everything Vaughn. Vaughn is an incredible photographer and made our wedding memories perfect! I came across his Instagram profile when looking for a wedding photographer and fell in love with his work. We weren’t sure what to expect when we met in person, but he was extremely professional and a pleasure to work with. He provided us with a detailed timeline prior to the wedding. During the wedding he made sure to keep everyone on track. He was very quick to find the perfect locations to take pictures and there were no delays or holdups. We couldn’t be happier with how everything turned out and we are so appreciative to Vaughn for making our wedding memories spectacular!!! We hired Vaughn for our wedding in October 2017 at Drysdale’s Tree Farm. Vaughn is one amazing photographer! I had met with Vaughn prior to getting engaged for a school project I was working on. It didn’t matter what question I had for him he answered me with professionalism and had no problem sharing his work with me. When my fiancé proposed we knew right away we wanted Vaughn to shoot our big day! Although it was intimidating choosing a photographer to capture the most important event of our lives, I knew from the first phone conversation with Vaughn that he was our guy! I was so comfortable speaking with him and that comfort carried right through to our engagement and wedding sessions. My husband is super shy, but Vaughn’s witty personality brought him right out of his shell. We were so relaxed and had so much fun just laughing and focusing on each other while Vaughn captured these amazing moments. Everything from the timeline of our wedding day to the placement of my Mom’s necklace on my bouquet….all of the little details Vaughn looked after, going above and beyond. As a bride, you do not get a full view of the day and everything going on as the day flies by. Thanks to Vaughn we now have a collection of beautiful photos to display and flip through to relive our special day. We are beyond happy. Memories we will cherish forever. One word for Vaughn….AMAZING! We had him for a destination wedding in Punta Cana at the Majestic Colonial resort. From the very beginning when booking and exploring his portfolio he was very informative, and not pushy to purchase other packages. One month before the wedding we had a video conference via Facebook to create the timeline for the wedding and he was so helpful. He guided us and gave us good ideas and tips to consider for the big day, things I would have never thought of if it wasn’t for him. Once we arrived at the resort he met with us when it was convenient for us and reviewed the timeline and everything about our special day. When the day arrived he was so organized and fun and upbeat to work with. My husband and I hate pictures but he had a smile on mine and my hubby’s face the entire time. We had a very big bridal party of 18 and he kept us all on track and most importantly made us all look amazing. The bridal party and all the guests loved him and his upbeat personality. I thought it would take months to get the pictures back but it only took a week and half! I couldn’t believe it! All of the photos are amazing and my husband was so happy with the product and he didn’t want a photographer in the first place. His exact words were “thank gosh we had Vaughn”. My thoughts exactly. I would recommend Vaughn to anyone in a heartbeat. We will cherish our wedding photos for the rest of our lives and we have Vaughn to thank for that. If you want your special day to be captured in utter beauty, Vaughn is the way to go. From the first meeting we had with Vaughn, we knew we had to have him shoot our wedding. Vaughn is such a fun, easy going, creative photographer who will do just about anything to get the right shot! All of our pictures are amazing and we look at them often. Vaughn Barry Photography will always be our photographer for many years to come, he is 100% recommended by us for not only your special day but any photography needed!! Five stars says it all! We could not be any happier with Vaughn Barry’s amazing photography skills. Not only did he photograph our wedding but our engagement session as well. His relaxed nature, made our ‘camera shy’ personalities disappear. Making our wedding day photos flawless. He isn’t afraid to venture onto new grounds for the perfect backdrop and angle. I’m pretty sure we seen him laying more in the dirt, rather then tip toeing around puddles, on both photo sessions. His drive and passion to capture beautiful memories shines in his work. He was able to capture so many emotions through the camera lens that we will forever hold in our memories. We would highly recommend Vaughn Barry! Vaughn is the best photographer we have ever had, even better than our wedding photographer! He did a couple’s photo shoot with us while staying at the Majestic Colonial in Punta Cana. He was professional and really made the experience very comfortable for both of us. I really appreciated his attention to detail (e.g., hand, finger, leg placement), which makes all the difference in the overall professionalism of each picture. He is also creative in his pose suggestions, so you won’t end up with the same poses in each picture or one’s you have seen before. Overall, I definitely recommend Vaughn and look forward to working with him in the future! Vaughn’s photography is nothing short of amazing! We just had some family pics taken by Vaughn and they were just spectacular!!! We first met Vaughn in the summer of 2015 when he photographed my son’s wedding at Belcroft Estates. He had a way to put everyone at ease throughout the day especially when we had to deal with the unexpected inclement weather. Needless to say the pictures were simply beautiful. I hope that we will have the pleasure of having Vaughn photograph for us again… maybe another wedding? It is hard to express in words how unbelievably amazing it was to work with Vaughn. His work is stunning and his is level of professionalism is outstanding. The day of our wedding he took care of everything: coordinating the shots, timing, picture locations, set up etc. He made me feel so relaxed and it was so reassuring to have him direct our group. Looking back this was one of the best parts of our day, because I did not have to worry about anything. Vaughn made this experience so positive and fun. Vaughn is so personable and will instantly make you feel comfortable. My Husband and his groomsmen had a blast with Vaughn and every single one of them complimented how accommodating his was with our group. Working with myself and my Bridesmaids, Vaughn kept us laughing in the below zero temperatures and every single picture turned out perfect! Vaughn is constantly searching out photo locations and opportunities. His level of creativity is remarkable and we were absolutely blown away with our photos. We have had so many compliments from family, friends, and coworkers, with everyone remarking that these were some of the best wedding photos they have ever seen. As a Wedding Coordinator, I work with many photographers in the industry and Vaughn’s work and professionalism is like nothing I have ever seen. I have nothing but great things to pass along about his service. We are so overjoyed to have had the privilege of meeting him and having him photograph our wedding day. The experience and our pictures have left us with priceless memories. We look forward to having the opportunity to work with him again. Thank you Vaughn! We are still on cloud 9! After researching numerous photographers for our destination wedding, Vaughn Barry stood out from the rest (by a long shot) so we decided to hire him for our wedding in Jamaica. We certainly were not disappointed, his laid back personality and genuine love for what he does made us very relaxed throughout the day. He took care of everything from keeping us on time to scoping out the best places for shots, as well as making sure we had fun so that the pictures he captured were real, and not posed. Vaughn was more than willing to go anywhere to capture the perfect shot (waist deep in the pool at 10:00pm just to mention one). His photography style is very unique and we highly recommend him. We were married at the Royalton White Sands Montego Bay, Jamaica two weeks ago and it was absolutely perfect. I will write a full review of the resort, wedding department, salon, etc. but I wanted to give a huge shout out to our photographer Vaughn Barry Photography, who made our day stress free and fun. Vaughn spent the entire day/ evening with us and our guests, capturing the whole thing. His laid back and easy going personality, and love for what he does made it feel more like we were hanging out with a friend than having a photographer following us around. We didn’t have to worry about the time, where to go for pictures (he had previously scoped out the best places), and he was excellent with engaging with the kids in our group in getting them to smile for pictures. His photography style was exactly what we were looking for- real in the moment pictures (not posed and fake). Although we have only saw a few sneak peek pictures so far, we are confident that they are going to be amazing. 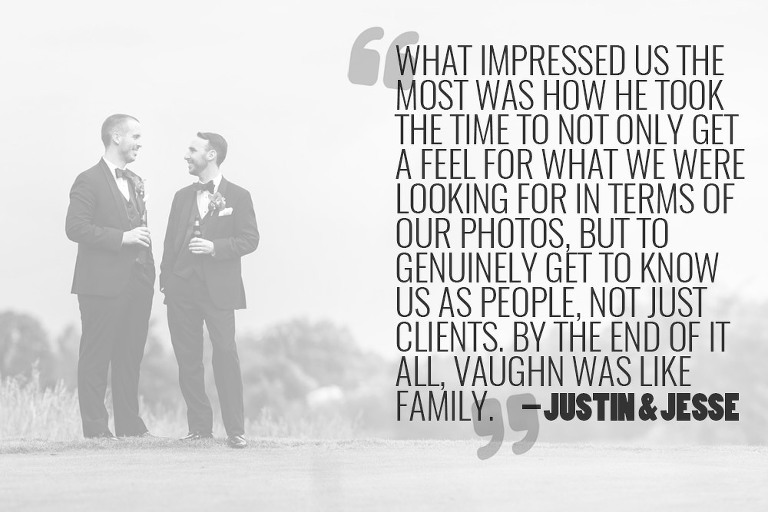 If you are looking to hire a photographer for your destination wedding, we highly recommend Vaughn. Vaughn Barry is amazing at what he does. He makes the experience that much more special and I can’t wait to work with him again in the future for other family events/gatherings. He has an eye for beautiful photos and is so much fun. His photos look natural but at the same time they are out of this world. Many people who have viewed are engagement and wedding photos have made a comment on how amazing they are and how they have never seen work like that done. He is worth every penny and if anyone has the opportunity to work with him, you are very lucky and won’t be disappointed. If you want a genuine guy who is unbelievably talented and passionate about getting the best shot or capturing the perfect moments then he is the photographer for you. By the end of both our engagement shoot and wedding day he was covered in leaves, mud and a fat smile across his face. He goes the extra mile to ensure a quality photo with breathtaking scenery. He is constantly scanning locations to find the best angles or unique colouring, texture or foliage for his photos. He never seems to miss a beat with capturing candid shots and true emotion. I can’t say enough great things about him. Anyone who has seen my photos is always impressed with the quality, style, coverage and attention to detail in capturing all the sentiment of the day. Finally, because he is truly excited about his work- photos are edited and delivered within a few weeks- his efficiency is unheard of in the wedding photography world. To top it off – he is the type of guy you want to have over for dinner and drinks after because he is truly that enjoyable. Vaughn allows you to experience your day without a care in the world and adds a playful atmosphere without impeding on the magic or romance of the day – HE IS ABSOLUTELY INCREDIBLE. Perfection! I feel when it comes to wedding vendors, when the groom goes out of his way to tell everyone about how amazing his photographer was….that speaks volumes. Book now, thank us later! Working with Vaughn and Kindsey was more than we could ever imagine. When we started planning our wedding we knew we had to have a photographer who could catch every emotion, detail, laughter and everything that comes with a wedding, Vaughn and Kindsey nailed it! July 24th 2014 we met with Vaughn up north in the beautiful Muskoka woodlands to do our engagement photos. Vaughn was so creative with the angles, positions, placement for each photo. We were blown away with the pictures he captured. He is so dedicated to his work and isn’t afraid to get dirty (he broke a sandal in the first 10 minutes and managed to do our entire session with no complaints walking on gravel, dirt, water and mud). Colby and I were amazed with how the photos turned out and couldn’t wait for Vaughn to photograph our big day. A year and a day later Vaughn and Kindsey shot our wedding. The two of them have such great personalities and are so easy to work with. They felt like another guest at our wedding. Vaughn helped calm my nerves and kept us laughing throughout the day. We are so impressed how they captured such raw emotion, laughter and love. I was worried about our short timeline to get all our photos and Vaughn managed to go above and beyond what we had in mind. He was so quick with arranging groups and giving directions to catch the best shots. Vaughn and Kindsey stayed late into the evening snapping such fun photos of family and friends at our reception. Every photo brought a smile to our faces and allowed us to relive each moment and see moments we weren’t apart of. We will recommend Vaughn to everyone we know. Again, thank you so much Vaughn for capturing our love story with your breathtaking photos. Mr Vaughn Barry… a man with an exceptional & extraordinary talent . He is a photographer that not only takes pictures but a photographer that is able to capture each moment, each tear, every smile, glance, emotion and thought in a blink of an eye or rather I should say, in a shutter speed of his own lens. The simplest of pictures that say a million words… which will leave you breathless, every time. We can’t thank you enough for going the extra mile to make this day and all of the days leading up to it a memorable one for us. Highly recommended to all in need of an artist! When I set out to hire a photographer for our engagement shoot, Vaughn came highly recommended. Boy did live up to those recommendations. Vaughn was patient, insightful and incredibly knowledgeable in assisting me with the planning of the surprise photo-shoot for my fiancée. What impressed me the most was the way in which Vaughn lives and breathes his craft; he brings incredible vision, creativity, passion and dedication to each shot. There are no second chances to recreate the exact moment of the proposal, and there is no one I would trust more than Vaughn to capture that special moment. We have received nothing but compliments from family and friends who have seen our photos. It is without reservation that I recommend Vaughn to anyone looking for a photographer to capture life’s precious moments. There is no doubt that we will be calling upon Vaughn on our wedding day. We were blown away with our engagement photos that we just received from Vaughn. Everything from the pictures, the awesome location that Vaughn recommended to us, all the way to the final packaging of the flash drive sent in the mail was top notch. We had only a few times available during our vacation to work with and he was fully accommodating to our needs and availability. I have recommended Vaughn to friends already and will continue to do so. The pictures that were captured were better than we could have hoped for. We’d book him again in a heartbeat. Thanks for the amazing pictures Vaughn; we hope to use you again in the future! Most amazing photographer any girl could ever ask for on her wedding day!! Vaughn was amazing and captured every important moment of our big day and really told a story with his photographs. He wasn’t afraid to lay in the dirt or grass to get that perfect picture and was always one step ahead of us. If you are looking for a photographer who will be sure to capture every moment with his own flair then Vaughn is your man! I would 100% recommend him to everyone I know. Vaughn is extremely competent, professional and full of great ideas. He was able to capture moments during our engagement shoot + wedding that nobody else could and avoid some obstacles that would otherwise be in the way. He was very easy to work with and always reliable. If you are getting married in the Barrie area, Vaughn is your ‘must have’ photographer. He is so talented and has such creativity. He photographed our wedding day and did an amazing job. Our pictures are spectacular! You will not regret hiring Vaughn to capture your special day. On a cold day in December Vaughn with his charismatic, professional demeanour was able to bring energy and life to each photograph he took. His time and patience helped to bring comfort and joy to our day. If you’re looking for stunning and unique results then look no further. Highly Recommended!! Vaughn was our photographer in January 2017 at Nottawasaga Resort in Alliston. Just like all the reviews below, we have nothing but amazing things to say about him. He’s great with people, we were happy to have him be a part of our most special day. We had family and friends comment on how great he was. He adds to the positive atmosphere by just being him, he’s supportive to your timeline and vision. He’s talented at what he does, he knows how and when to take those pictures you want to look at over and over again. He captures the special moments magically for a lifetime. We were highly impressed with his services. I would recommend him to anyone who likes high quality photos. 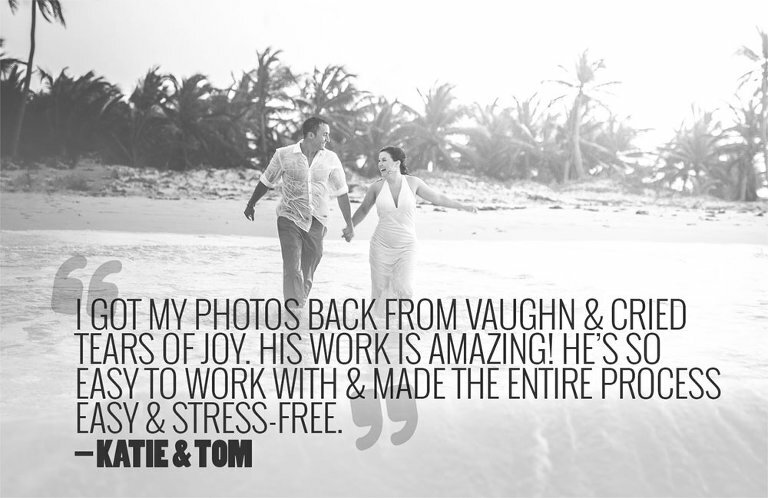 Vaughn is a very personal, professional photographer that my husband and I thoroughly enjoyed working with. His pictures tell the story of our wedding day beautifully. He was fun, and made our guests feel comfortable – we received many compliments on his attitude and enthusiasm. He was a great source of knowledge for our destination wedding at the Majestic Colonial in Punta Cana, and even joined us on a catamaran ride for our trash the dress session. His flexibility and responsiveness to our requests was greatly appreciated. I would say we received our wedding photos in record time (approximately 2-3 weeks after the wedding), and we loved the two videos (unexpected too!) that he put together for us. I must admit I get a little teary watching them! Thanks Vaughn for helping us capture the essence of the day and for taking pictures that we will look back on for years! Cheers and best of luck! Thank you Vaughn for capturing our wedding day!! You did a great job!! William and I love all the photos! You were very professional, fun, and very organized. I am glad you were part of our wedding team! Thank you! We found Vaughn’s work on Facebook and were taken back by the artistic nature of his photography. At our first meeting with Vaughn, we were reassured by his enthusiasm and attention to detail. We were more than pleased with our beautiful engagement photos last summer and Vaughn out did himself by creating our magical wedding photos. Vaughn’s daughter, Kindsey, came along with Vaughn to photograph our wedding which was an added bonus. We are so pleased with how Vaughn and Kindsey managed to capture the myriad of emotions that we and our guests expressed throughout the day. Our photos are reflective of so many special moments which are irreplaceable. I especially appreciate Vaughn’s ability to run a tight ship which gets the job done while keeping things light-hearted and fun. He’s been very prompt to respond to any questions and unbelievably quick at getting the finished product to us. We highly recommend Vaughn Barry! We met Vaughn about a month after we got engaged and began planning our wedding. We hadn’t even finalized a venue yet but we had read great things about him so we decided to meet him for coffee and to get a sense of who he was and if he would fit with our vision. As soon as we sat with him and talked a little about our special day we knew he was our only choice. His upbeat personality and his excitement when talking about his work made are decision easy. Throughout our wedding planning Vaughn was very easy going and flexible with our various changes and more than willing to help us out and offer advice during our planning process. When we met Vaughn for our engagement photos, he was as happy and chipper as usual, and made our day fun and carefree. As we walked around Sunnidale Park taking our engagement photos it felt more like walking around with an old friend. Even on our wedding day we felt as though Vaughn was more of a friend than someone we had hired to take photos of our wedding. Throughout the day Vaughn was always around but you also never knew where he was. Always able to capture those special moments from various angles. He was professional but also fun and light hearted, and would show you little previews of certain shots he took to make sure you were happy. We were able to view some photos a few days after the wedding and they were exactly what we were hoping to see. He went over and above, capturing images that we didn’t even think were being captured. He is worth every penny, and we’re glad we upped our budget for photography considering its the only physical proof of your special memories. We cant thank Vaughn enough for everything he did for us and turning our wedding day into a story that will be able to be passed on to our children. Thank you Vaughn, Our day wouldn’t have been the same without you. Thank you Vaughn for doing such an amazing job on both our Engagement Shoot and Wedding day! We loved every single picture and we’re most thankful for how much each picture captured our style and personalities! Will definitely be recommending you to friends and family.